Version 3 extends national program qualifications to ensure tighter building envelopes, require more efficient HVAC equipment, and improve indoor air quality and occupant health through water management and provision of fresh air. Where Version 2 called for 5 or more ENERGY STAR® qualified appliances in a new home, Version 3 requires all refrigerators, dishwashers, ceiling fans, and exhaust fans to be ENERGY STAR approved, in addition to ENERGY STAR light bulbs and fixtures in 80% or more of RESNET-defined qualifying light fixture locations. The home energy rater’s Home Energy Rating System (HERS) Index remains the primary measurement tool for ENERGY STAR home certification. Builders must submit the home’s architectural plans to the rater for review and analysis, which includes modeling the home’s energy performance using a RESNET-approved software program and information obtained during field testing. A score is derived from this model, which is referred to as the home’s HERS Index. This index must fall within an acceptable range in order for the home to receive the ENERGY STAR label. During field testing, a RESNET-certified rater must use RESNET-approved testing protocol to determine a home’s envelope leakage. The target leakage level was bumped down a notch (1 ACH50) in each climate zone in EPA’s most recent requirements. To achieve certification, the home’s leakage rate must be equal to or less than the target leakage level. The builder must complete the Water Management System Builder Checklist, which documents conformance with best building practices and materials to protect roofs, walls and foundations from water damage. The integrity of the home’s building shell, its general air tightness, insulation levels and quality are ensured through conformance with the Thermal Enclosure System Rater Checklist. This checklist is completed by the home energy rater during visual inspections, before and after drywall installation. Insulation levels must meet or exceed 2009 IECC specifications for the home’s climate zone and achieve Grade I installation as defined by RESNET. The functionality of the home’s HVAC system, its size and type, efficiency levels, and configuration are verified by conformance with the HVAC System Quality Installation Contractor Checklist. This checklist is completed by the HVAC Contractor. The home energy rater must then confirm the information provided on this checklist is accurate by completing their own checklist (the HVAC System Quality Installation Rater Checklist) and measuring actual pressure differentials and flows while the system is operating. 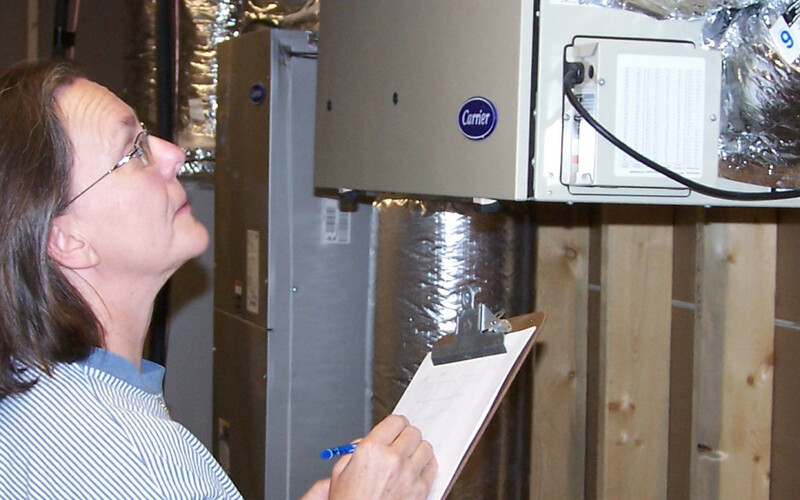 Additionally, a RESNET-certified rater must use RESNET-approved testing protocol to determine the HVAC system’s leakage. The target leakage level was bumped up to 6% of the conditioned floor area in EPA’s most recent requirements and both leakage to the outside and total leakage must be evaluated. To achieve certification, the HVAC system’s leakage rates must be equal to or less than the target leakage level. The home must also have a provision for continuous fresh air ventilation, to ensure emissions from indoor sources are diluted and to carry indoor air pollutants out of the building. This is particularly important due to the tightening of the building shell, which limits or prevents indirect exchange of fresh air.